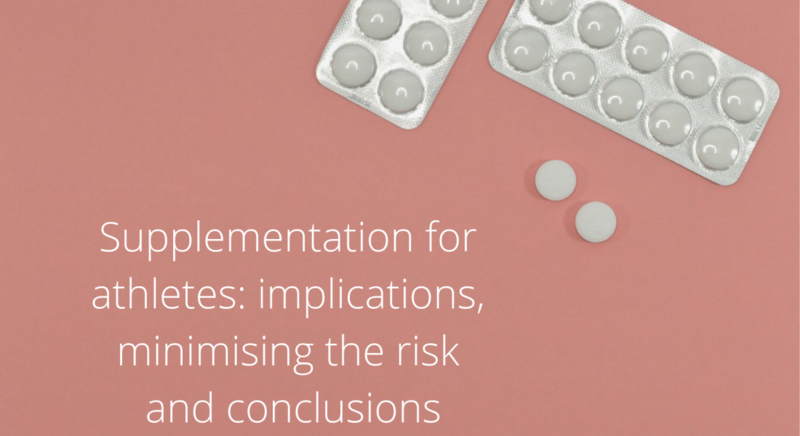 Join us for part 2 of our critical discussion on supplementation and its’ implications for athletes, covering ways athletes can minimise risks and our final conclusions. Some may argue that it falls down to the individual who should accept the risk of consuming supplements, but I personally think that the industry requires more transparency. Supplements offer a whole host of benefits to the athletes taking them: For those on the go spending a day at the track or by the pool, a protein shake offers a practical (not to mention quick and easy) alternative to cooking a chicken breast. For those who can’t or even choose not to eat red meat, supplementing Creatine Monohydrate will, according to Rawson’s Meta-analysis (a review or 22 studies) and this study by Branch increases strength, power and lean mass. The athlete who is self-funded and has a working job on the side of their training may need a pre-workout supplement before an intense training session. As a rule of thumb, AntiDopingScience recommends athletes avoid any ingredients they haven’t heard of- and therefore have done no research on. Athletes should also eliminate ‘red-flag’ products that full under the broad categories of the WADA prohibited list such as anabolic agents or stimulants. In spite of ‘safe’ supplements, there is no guarantee that a supplement will contain what it claims to – so athletes should be aware of this when considering the aforementioned guidelines. Reduce the risk – can you take a food first approach? As always, if you’d like to find out more about Versapak Doping Control or enquire with us about Tamper Evident doping kits, please feel free to get in touch with us today, here.